You've just described the classic science fiction story "Nightfall" by Isaac Asimov. I wouldn't say I was disappointed but I was very surprised by how light it stayed. When I hear people talk about seeing the stars during an eclipse, I think about it being like the night sky. When I watched this eclipse, I did not see a night sky. I saw no stars what so ever. What I saw was a very abnormally extreamly dark blue sky, the sun with a black dot (the moon) in front of it, and I saw Venus and Jupiter on each side. Which are not stars, they are planets, and they are often visible in the daytime even when there is no eclipse. On the plus side I was really amazed to see the moon in front of the sun in 3D, and be able to look right at it. It looked nothing like images or video of it. I didn't even buy eclipse glasses, because to me watching a circle slowly disappear on a filter is not very interesting. But actually seeing the moon in front of the sun with my own eyes was amazing. It's one of those things that you just can't describe, or even show with pictures or video. I think for the future I would tell people that a total eclipse doesn't really get that dark, and forget about a partial eclipse. 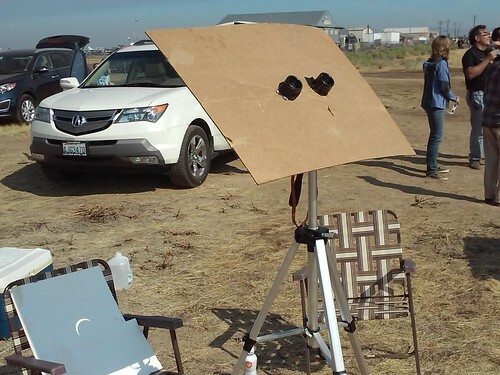 If an average person was outside during a partial eclipse, and didn't know it was happening, they would probably never even notice it. That said, I hope I can see at least one more total eclipse. I've seen some beautiful photos of eclipses, but I agree, it's not the same. At all. No photo can capture the way the corona shimmers and dances, and no ordinary camera can accommodate the color/light contrast - it's just too extreme. Filters help, but by definition, you lose something when you filter. I tried to take photos early on, before totality, but gave it up and just watched. It's like trying to photograph the Grand Canyon. Some things you simply can't truly get without experiencing them firsthand. A total solar eclipse is one of those things, because it's a total sensory experience. Glad it worked out in Madras. I had originally planned to see it there, and arrived about noon on Sunday. But that thick smoke layer late afternoon convinced me to drive back over to the Willamette Valley. No way was I taking a chance on missing it. It was sure cooler on the west side too, which is always a plus. Definitely an epic traffic jam on I-5 going home. My normal driving time from Salem to Seattle is between 3 and 4 hours, including rest stop. This trip took me eight hours actual driving, and an additional seven hours I took for breaks because I just couldn't take it. I didn't see anything like normal traffic until 3:30 am Tues, which is when I woke up from my last nap and drove that final leg. If they had another eclipse next week, I'd do it all over again. I like your set-up BTW. Which binoculars did you use, and do you use them for stargazing? I have an 8" dobsonian that I made in 2011 in one of Dobson's last classes. But I'm looking for recommendation for something more portable. Last edited by jacqueg; 08-23-2017 at 06:09 PM..